Cat Pendants, Cat Rings, Cat Bracelets, Cat Earrings. See our Cat Angels & Cat Paw Print Jewelry too! 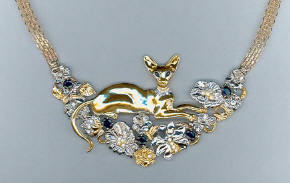 Breed Specific Cat Jewelry ...Compare! Gifts for Cat Lovers everywhere! 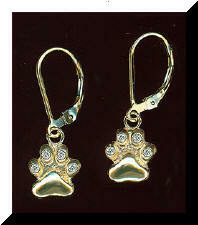 Each Creation of Pet Jewelry is Custom Designed, Carved & Finished by Precious Pets Exclusively! CLICK ON YOUR CAT BREED TO VIEW YOUR BREED IN 14K GOLD! 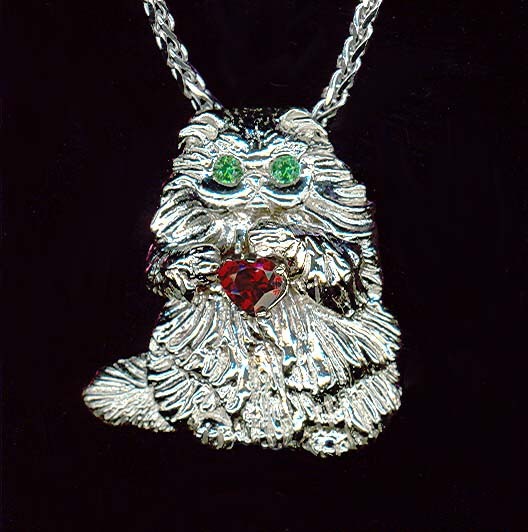 American Curl Cat Jewelry Himalayan & Silver per. Click here to read payment options. CAT & DOG, PET MEMORIAL JEWELRY! & Mountings for a "LIFEGEM"
CAT MEMORIAL JEWELRY, DOG MEMORIAL JEWELRY, PET MEMORIAL JEWELRY, ANIMAL MEMORIAL JEWELRY! CHOOSE ONE OF OUR DESIGNS OR HAVE ONE CUSTOM MADE! A small amount of your pets ashes go right into the Casting of your Pet or Animal Memorial Jewelry, inlcuding our Memorial Angel Wing. You will have a Memorial of your Beloved Pet Forever!!.. ALSO a "LifeGem" can be mounted into many styles including our Angels! 1. A WT GOLD PERSIAN HOLDING A GARNET HEART, REPRESENTS THE ASHES OF 13 PAST SILVER PERSIAN MEMORIES! 2. 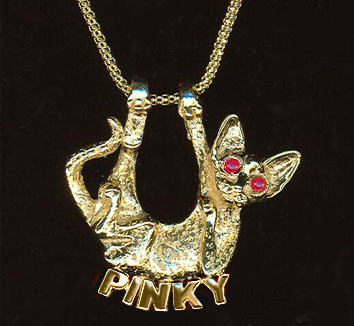 "PINKY'S" ASHES ARE NOW EMBEDDED IN THE DARLING DEVON DESIGN AND WILL BE REMEMBERED FOREVER! 3. 14k GOLD, DIA. 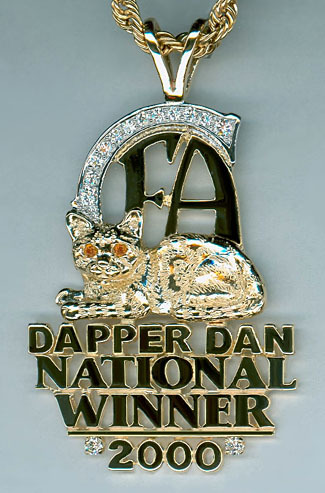 STUDDED CFA IS CREATED IN DAPPER DAN'S MEMORY. FOREVER LOVED WITH HIS EMBEDDED ASHES. 4. 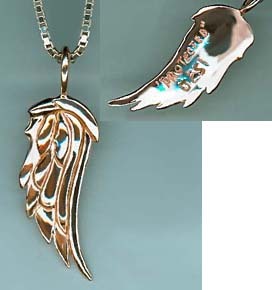 DESI'S LIFE WILL BE REMEMBERED IN A ROSE GOLD WING, INCISED ON THE BACK IN HIS MEMORY. SEE DETAILS ON THE CUSTOM PAGE - ANY BREED AVAILABLE !